a mineral supplement to provide salt, calcium, phosphorous, and selenium. For example, you might have alpacas that live on the pasture and have free-choice pasture forage available at all times. In the winter when pastures provide little to eat, it's especially important, but all year round you might supplement with grass hay. 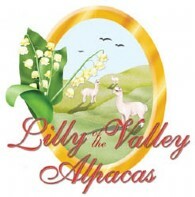 (Alfalfa hay can provide too much protein for the alpacas' nutritional requirements and cause them to gain weight. At times of late gestation, during lactation or to help with weight gain, feeding an alfalfa hay can be a good idea.) And once each day, you would feed your alpacas a pelleted feed designed for llamas and alpacas in your area based on the nutritional content of hay grown locally. The nutritional content of the pellets complements the nutrients in the hay so that together they completely meet all the alpacas' nutritional requirements. At all times, they would have a free choice mineral supplement designed for alpacas that is available for purchase on the Internet. The nutritional content of hay varies depending on when it's cut during the life cycle of the grass, on other growth factors such as water and sun, on the nutrients in the earth in which its grown, and also depending on the application of various fertilizers. You can have your hay analyzed by having a core sample taken. Also, you'll want to learn by looking at the hay whether it's a good quality for your alpacas. It should be green, smell good and fairly free of seed-heads. Please feel free to call and arrange a farm visit. We adore our alpacas and enjoy sharing them with others. We're sure that you will love them too, and we'd be happy to discuss their care requirements with you...Contact Us!